How does wood petrify? What does it look like, and is it really as beautiful as they say? During our time in Arizona, we unraveled these mysteries. 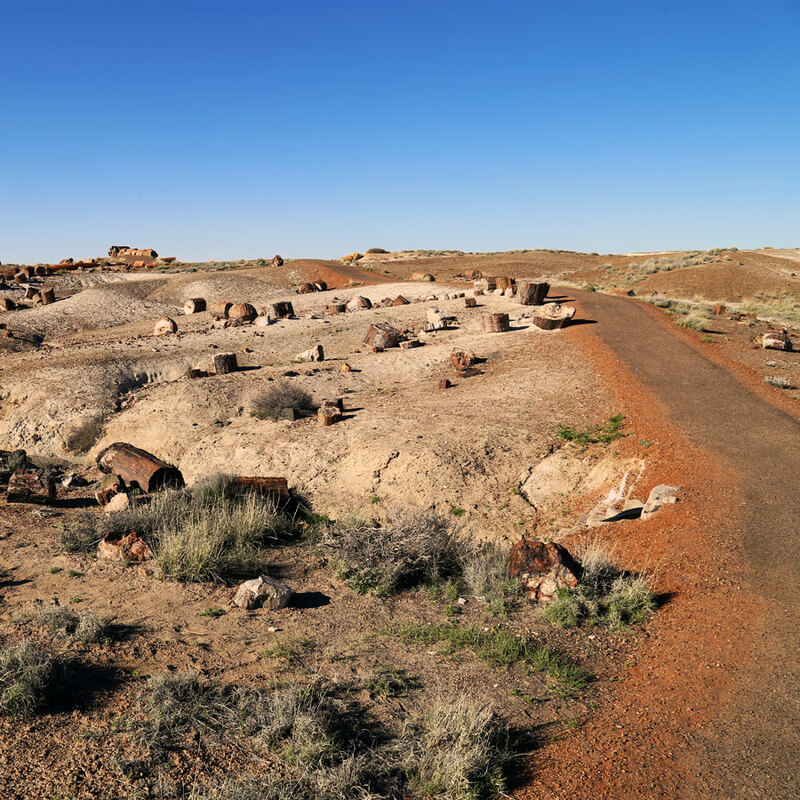 On the same day we visited Meteor Crater and Homolovi State Park, we headed even farther east for a whirlwind trip to Petrified National Forest. 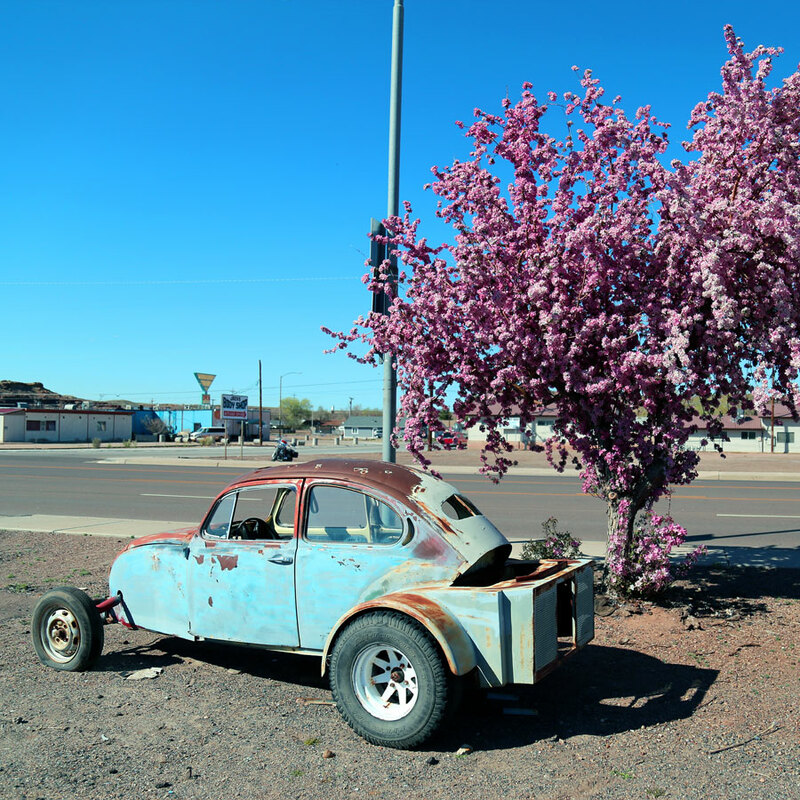 On our way, we passed through Holbrook, a town that seems to fall squarely into the "tourist trap" category. Still, it did have a pretty cool display of displaying Franken-VW Bugs. 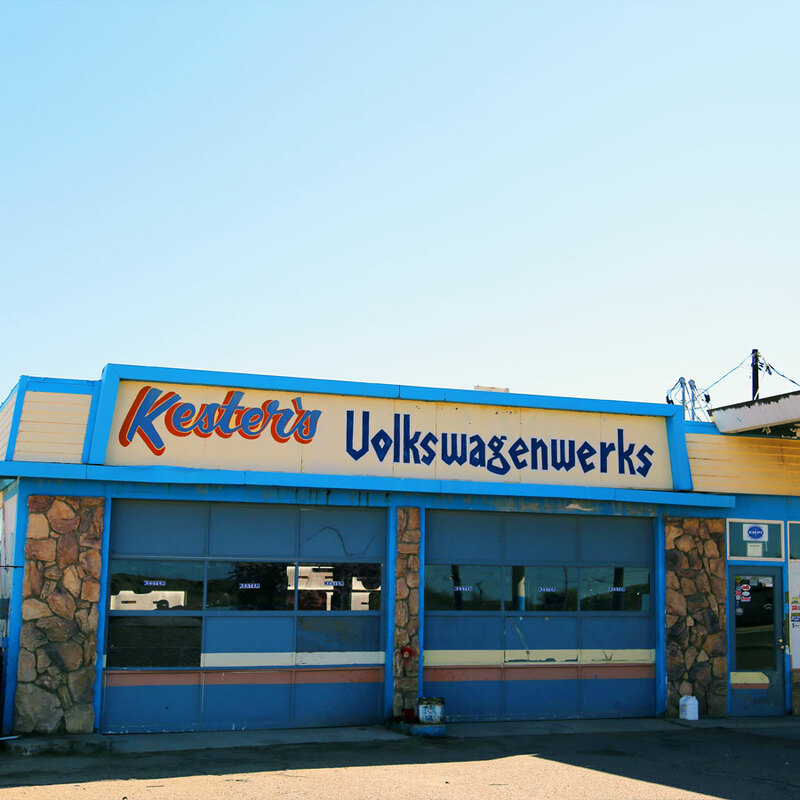 With its location on Route 66, there's a lot of vintage everything in Holbrook. Vintage cars are no exception. 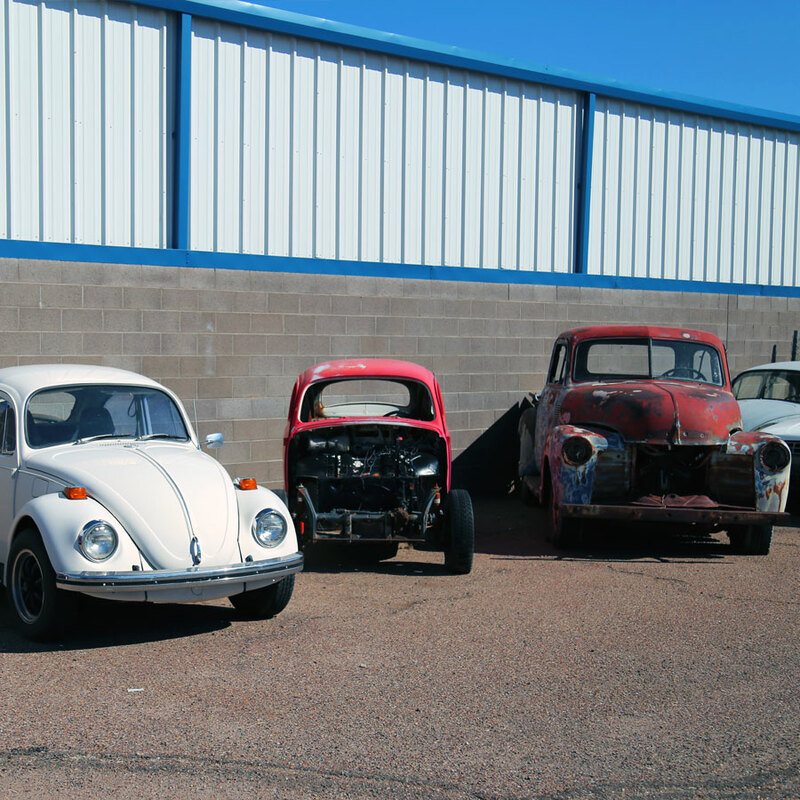 There were maybe a couple of unmodified VW Bugs hanging out, but the rest were creative takes on the car. In the market for a stretch-Bug? After a multi-mile drive down isolated roads, we reached the park entrance. And we got our first view of the park's namesake. We stopped at the southern visitor center to pick up a map and get oriented. 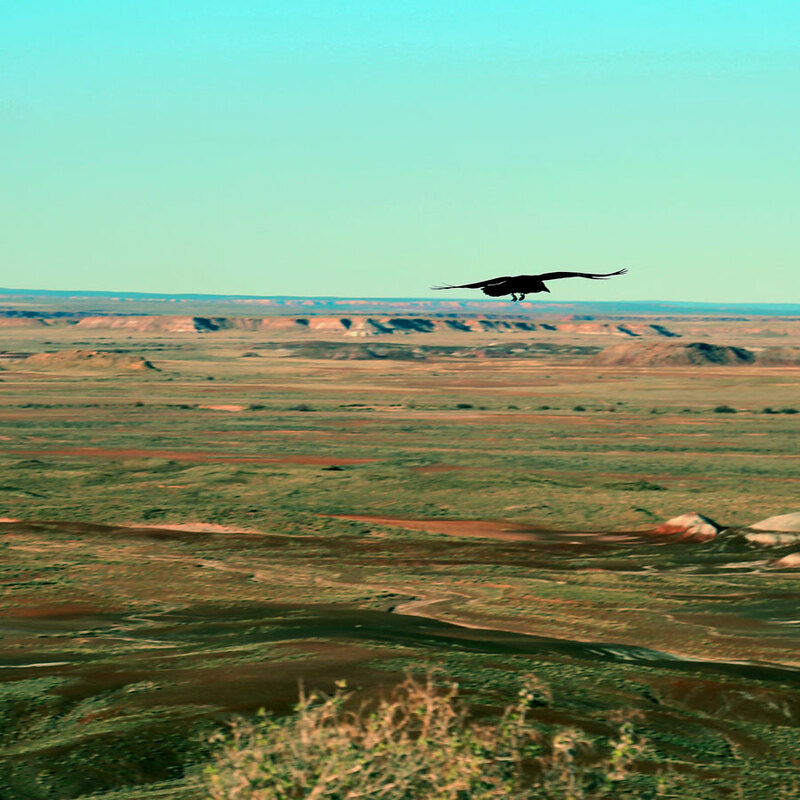 A helpful ranger suggested some highlights, and then we took off. 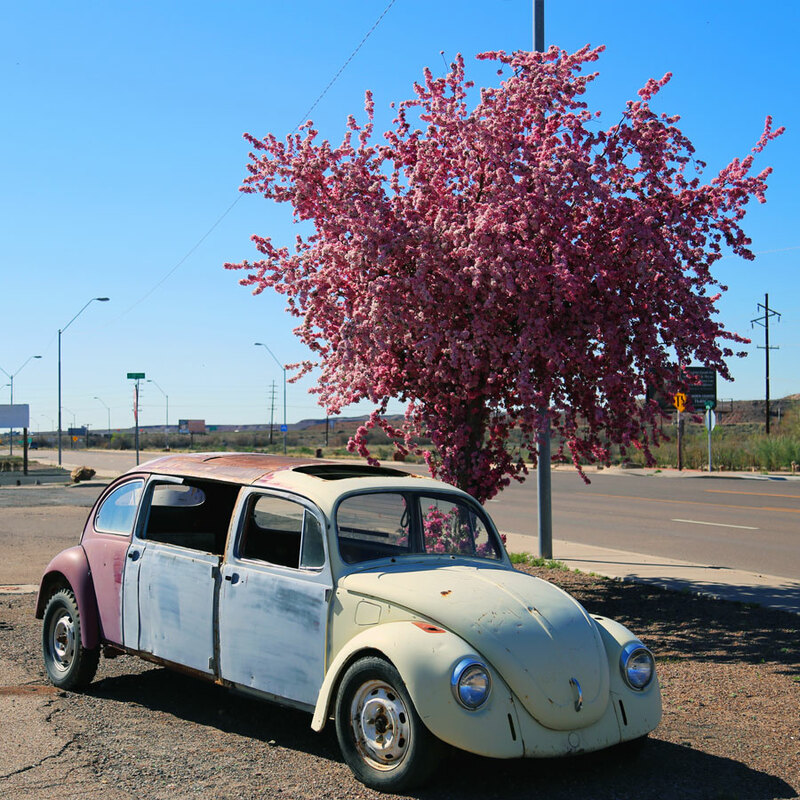 While there is a backcountry at Petrified Forest that is ripe for exploration, most visitors stick to the main road and stop off at the highlights; it's a stop-park-hike kind of place, with few trails. Considering we had just a few short hours, this worked out well for us. 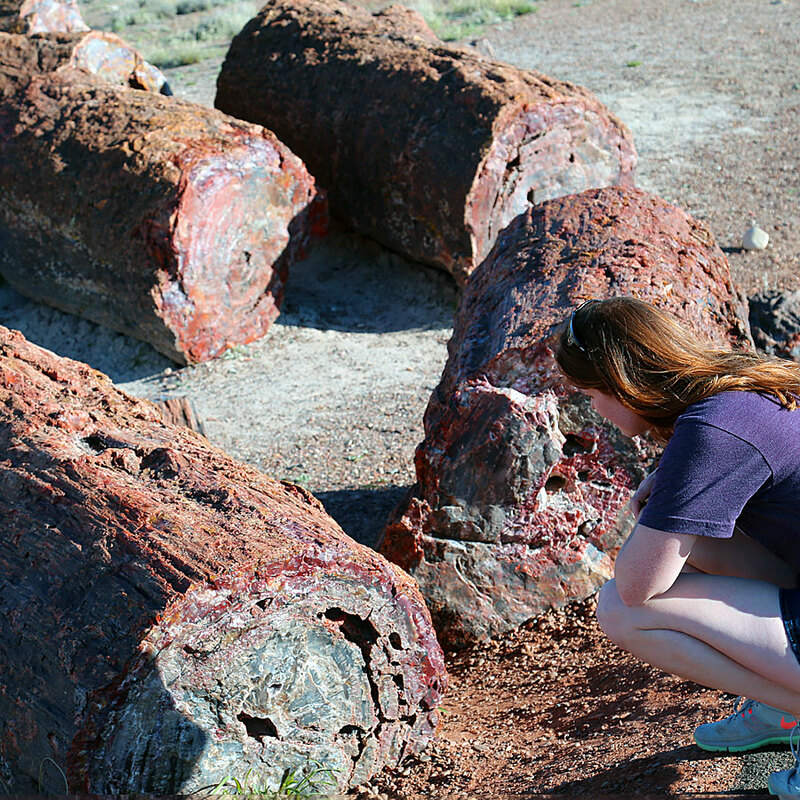 The first order of business was checking out the petrified forest, itself. 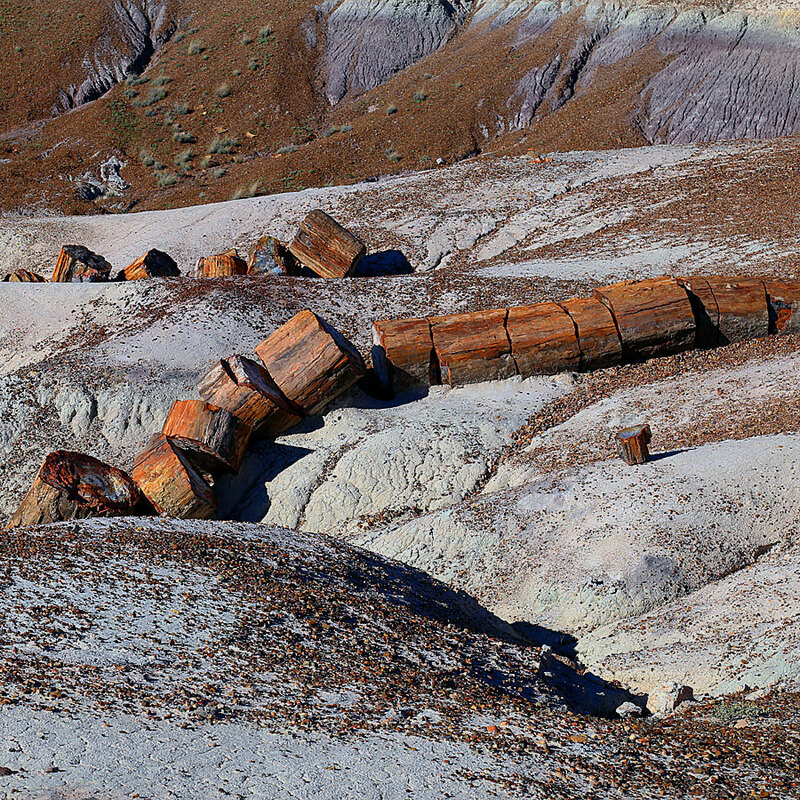 Crystal Forest is a 0.75 mile loop trail that meanders through an enormous gathering of petrified wood deposits resting on the ground. 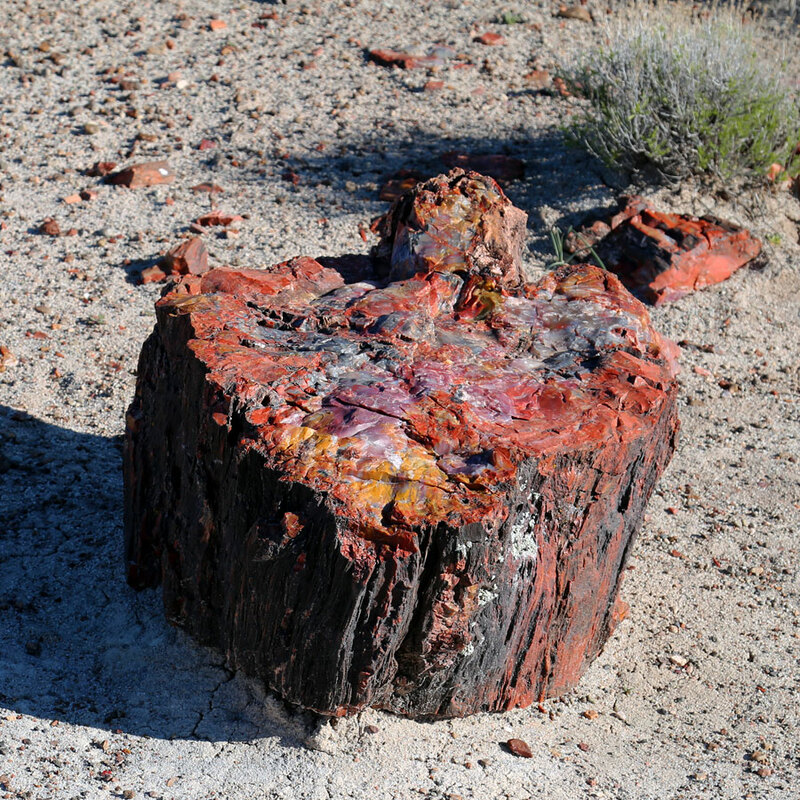 This trail lets you see the petrified wood up close. While some of the logs are isolated, others remain just where they fell, in the arrangement of a tree trunk. 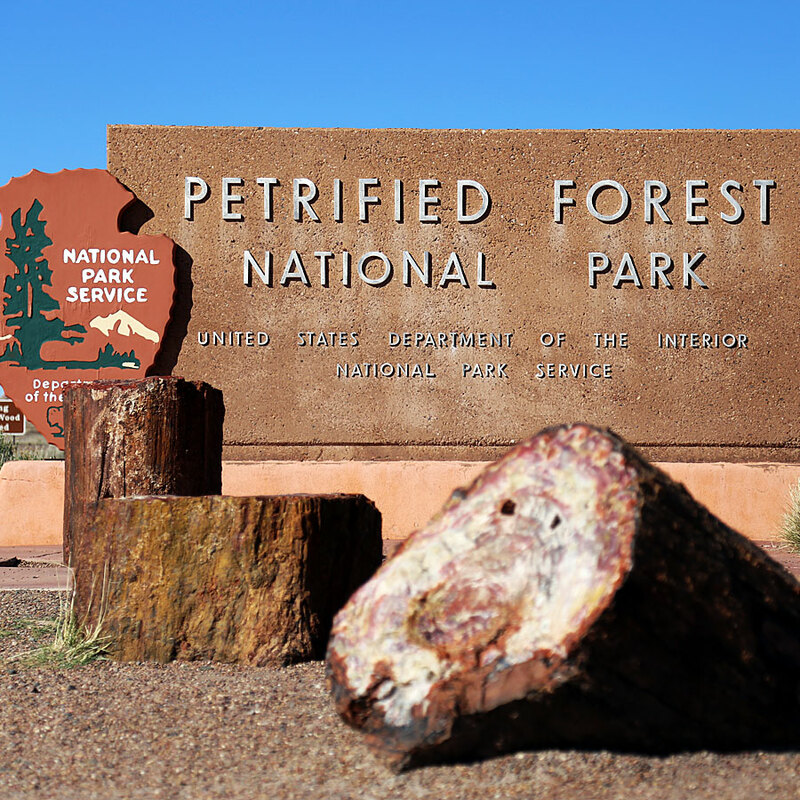 I had always heard of Petrified Forest National Park, and of petrified wood, but growing up so far from here, I didn't really understand what it was. "Petrified" meant "afraid" to me, but this... it looked like gemstones. My big question was, "How did this happen?" The answer lies in science. 225 million years ago, during the Late Triassic Period, these trees — whose species are now extinct — were alive. They stood near the Earth's equator along the southwestern coast of Pangaea, an ancient supercontinent. When they died, some fell into river channels. And some of those channels were mixed with volcanic ash. Dissolved silica from the ash turned the wooden interior of the logs to quartz crystals. Minerals like iron oxide were responsible for the new, brilliant colors. Then, 60 million years ago, the whole region (the Colorado Plateau) was lifted upward by tectonic movement. 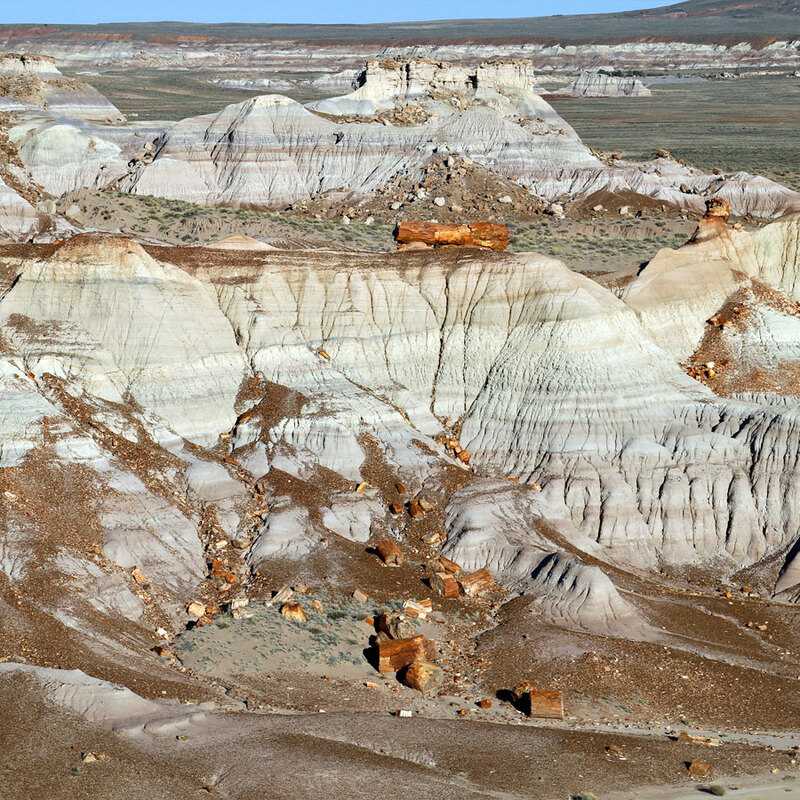 Erosion began to eat at the plateau, creating the amazing formations seen today at Petrified Forest National Park and Grand Canyon National Park. Erosion continues today, changing the landscape of the park very gradually. One noticeable change in recent years is the erosion of "pedestals" on which some of the petrified logs sit. In the picture below, notice a log sitting atop a ridge, while another has crumbled to the ground below. Just a few years ago, the stone supporting the second log eroded enough that the petrified wood could no longer stay aloft. Anybody wanna take a bet on how much longer the second log will remain? 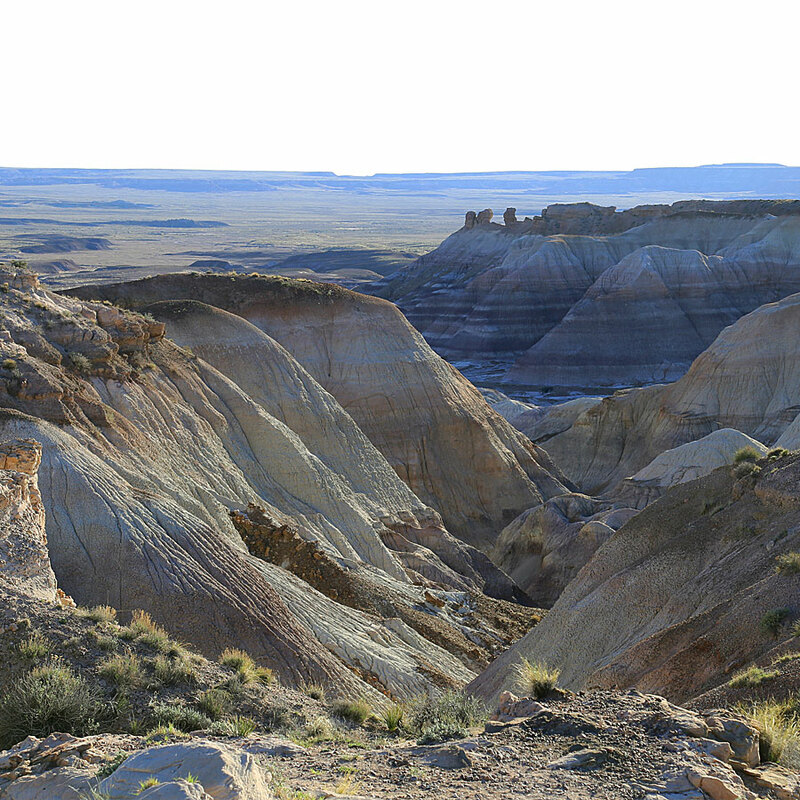 One of the most stunningly beautiful parts of the park was Blue Mesa. This gorgeous formation gets its name from the color of the bentonite clay that forms it. The delicate clay doesn't support plantlife, which unfortunately just contributes to its continued erosion. I had always heard of badlands, and I'd pretty much just associated them with old Westerns. Badlands were where bad men shot other bad men for bad deals. Turns out that's not what badlands are at all. It's a geologic term that refers to sedimentary formations like these. They have been exposed to erosion, which leads them to show their colorful layers. 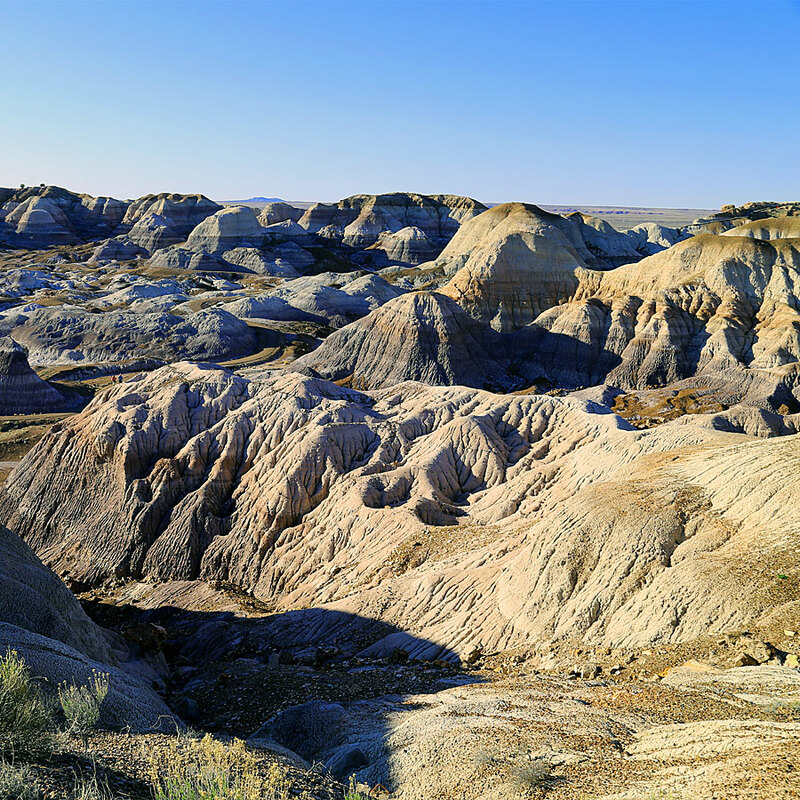 In addition to continually eroding, the clay that makes up the badlands in Petrified Forest National Park is always expanding and contracting due to exposure to water. It's an ever-changing landscape. 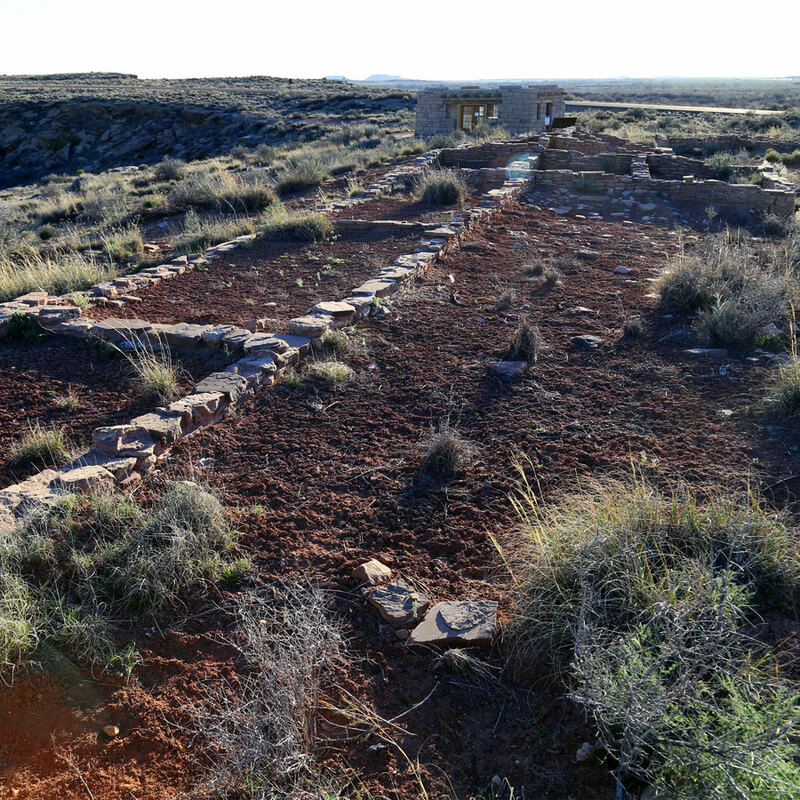 Our final stop before the park closed was at Puerco Pueblo, the remains of a 100-room village located on the Rio Puerco. Around 1300 CE, the population was at its largest at around 200 people. 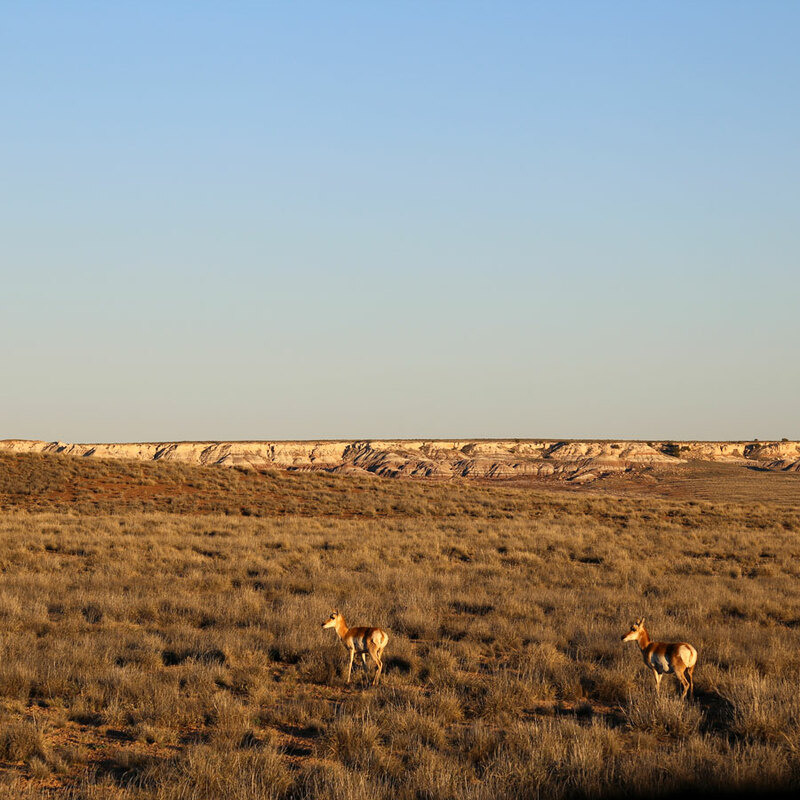 Puerco Pueblo is over 100 years older than Homolovi just down the highway. The rooms included abodes, kivas and storage spaces. After having visited Petroglyph National Monument in New Mexico and Seminole Canyon State Park in Texas, I was eager to see the more rock art. While Newspaper Rock, a site covered in hundreds of petroglyphs, is located a short distance away, the art is in shadow in the afternoon. More impressive to me were the up-close petroglyphs here at Puerco Pueblo. I was impressed by one petroglyph in particular that helped keep the time. During the summer solstice, sunlight passing through a natural cut in the rock aligns with a petroglyph engraved in the rock. 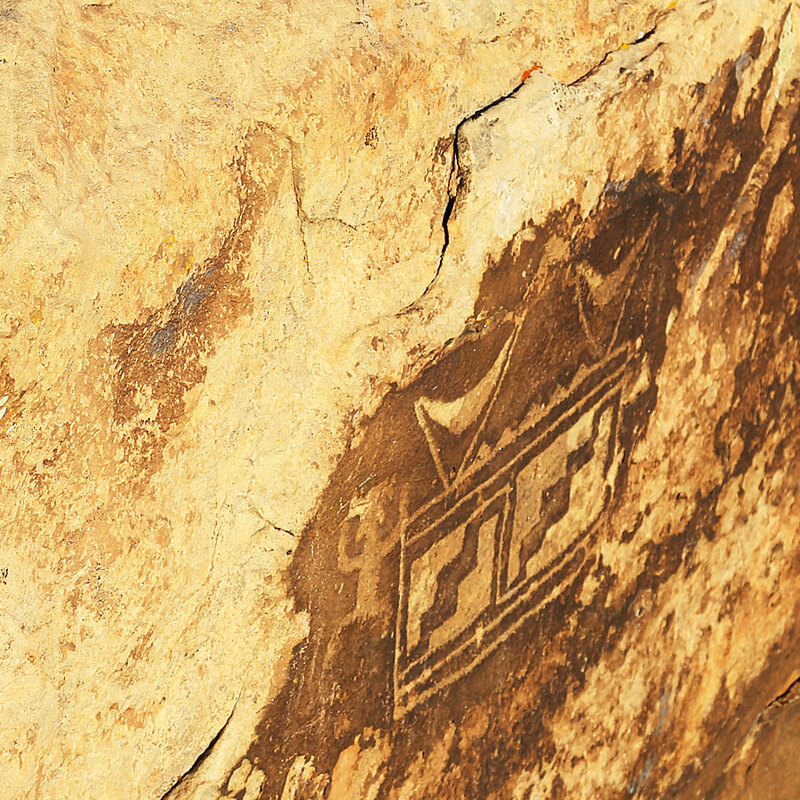 The petroglyphs at Puerco Pueblo are easily accessible from the trail. While the plant life was sparse, beauty ran rampant, and we did find a few animals enjoying it along with us. As it's never a complete tour of a national park without seeing deer, these two complied. While each of our nation's national parks have their own personality and unique qualities, Petrified Forest National Park was perhaps the most unique landscape I've seen yet. If you're ever in the Albuquerque or Flagstaff area, do not miss this gem. 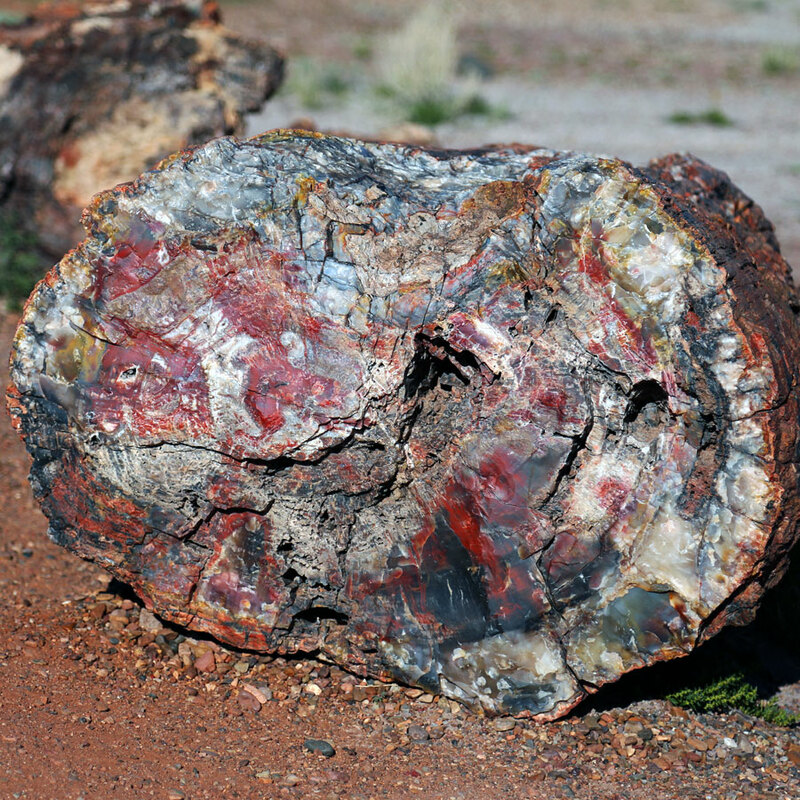 Have you seen petrified wood? Was it like what you were expecting?